Help correct tongue-thrust and poor orofacial habits, support positive orthodontic/orthopedic outcomes, enhance appearance, improve breathing and sleep. Bring the muscles of the mouth, jaw, and face into harmony, and help patients maintain good oral health for a lifetime! 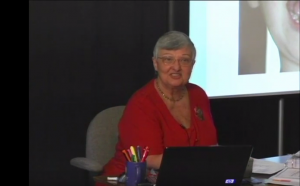 Taught by master therapist Barbara J. Greene, this complete online course is perfect for hygienists and other dental workers looking to grow their professional potential – not to mention speech therapists and other health and wellness professionals. And you get more than just the course. You get generous resources to help you establish yourself as a myofunctional therapist, whether in your current office or independently! Take the course at your own convenience and pace, anywhere you are, whenever you want – at a fraction of the cost of an in-person training. Nearly 18 hours of instruction with patient demonstrations, before/after case studies, diagnostic criteria, week-by-week therapy techniques, professional tips, and more! A course manual, which contains complete info on the therapy, diagnostics, exercises, and reporting. Also includes sample forms, promotional materials, patient handouts, and more – everything you need to get your practice up and running. Access to supplementary materials including therapy process documents, patient information packets, sample re-evaluation forms, exercise reference sheets, and a quick reference guide for addressing common problem areas. This complete online course is available to you for just $675. 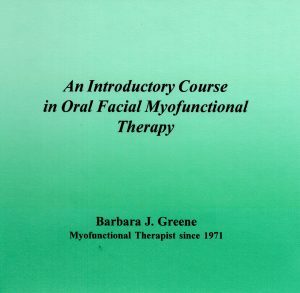 Note: An Introductory Course in Orofacial Myofunctional Therapy is for the benefit of you and your practice in providing myofunctional therapy for your patients. It is not affiliated with any organization. Barbara J. Greene is an independent provider of therapy techniques from more than 40 years’ experience in private practice.